Native seed mixes planted on Conservation Reserve Program (CRP) acres are suspected in two new Palmer amaranth infestations in Iowa this summer. 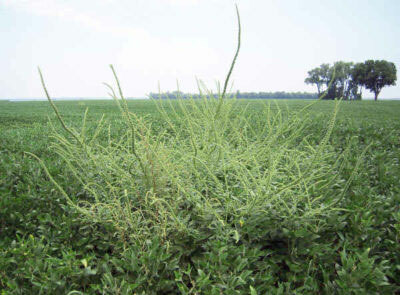 Iowa State University Extension weed specialist Bob Hartzler says while previous Palmer infestations have been tied to animal feed and commercial grain transportation, the use of seed mixes represents a new method of introduction. “Both sightings were found in new CRP plantings that were planted to a diverse mix of various native species. One was for pollinator habitat and one was for quail habitat,” Hartzler says. “It’s another way that Palmer is finding its way into the state, so that is a concern.” Palmer amaranth is a threat crop production, but Hartzler says farmers should not be overly concerned with this latest finding — at least for now. “Our concern is that in the year or two that the Palmer is likely to survive in this habitat, some of that seed could move into crop fields,” Hartzler explained. Many CRP seed mixes have species produced in other states, according to Hartzler, and it’s possible the seed came from a state with more widespread Palmer amaranth issues. The new infestations occurred in Muscatine County in southeast Iowa and Madison County in south-central Iowa.